Ariel is such a joy. She loves people, she loves to talk and she needs company. Shown only 2 times in 2006, she placed 1st both times. This pretty little girl, with such a shinny black coat is very elegant, feminine & stylish. 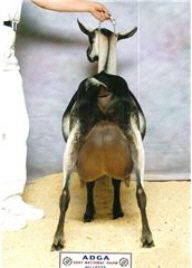 She is an angular dairy doe with a very long lean neck and has flat open ribs. Her dam placed in the top ten in 2005 & 2006. 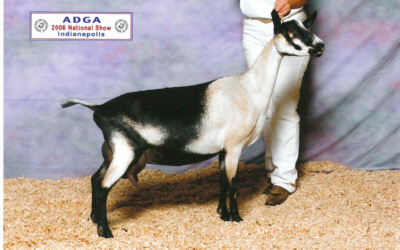 Ariel is an uphill doe with a nice top line and good strength of bone and width through out. She does toe out a little in the front legs. This is common in the Willow Run lines. Her rear udder is well attached and arched well. Her teats are of proper size, yet a little to the outside. She has a strong medial, so as she matures this should bring in the teats as the medial lifts & supports the udder. She has good extension & capacity of fore udder. She is very deep in the body and wide between the hocks. She is my friend and I can’t imagine parting with her. She has become a permanent fixture. Ariel had a single in 2006 & 2007 and made up for it in 2008 with quads. She gave us a fantastic milk year. After her long trip to Indiana in 2006, Ariel does not like to travel. We limit her show trips and she is not shown very often. We’d rather leave her home so that we can enjoy her year after year, then stress her and lose her at a show.